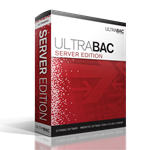 The UltraBac Server Edition is an easy-to-use, fast and reliable backup solution providing Microsoft certified compatibility for a single Microsoft Windows server. The Server Edition includes one Backup Engine, one Remote Local Server Agent, one Locked File Agent, and data protection for one server. Back up open or locked files to any type of local media or network disk.